The Around the Island Adventure offers many rewards and much excitement on the way - we met up with the walking warriors who went around Ibiza's coast. Making my way along the port area of Ibiza Town on a warm October afternoon, I set off to meet the walking warriors who had just made their way around Ibiza's coast on foot on Walking Ibiza's twice annual Around the Island tour. It wasn't hard to spot whom I would be meeting up with; the air around this group of 12 hikers was one of palpable excitement. Despite the weariness that comes with completing 260 km and climbing over 8600 metres in 12 days, there was an excited energy shooting off everyone in the group; perhaps it was the elation of having seen, discovered and conquered the island. It certainly felt like a heady day and the excited mood was very contagious. This island adventure starts from the statue of the mariner in the port and also ends there. I wondered how the energetic buzz of the finish, with all bearing glasses of pink Cava in hand contrasted with the start. I'm sure it was at the same level and it seems like it lasted the whole way through. First, I spoke to Khossaan, a great man in many ways, having much height and who looks to have the sort of strength that could to ten of these adventures. This year he got the last-minute chance to take part in the walk and jumped at it. He mainly knew Ibiza for its parties and got to see an entirely different entity. For him, it was ‘like going to another place entirely', seeing parts of the island that few get to see. Also, he felt a ‘real sense of satisfaction and achievement' and felt unique in (probably) being the only person from South Africa to have ever done this walk. Two of the women that did the walk, Maartje and Michaela (known as Mickey) both felt a little nervous about doing the walk as neither had completed that kind of distance before. An average of 26 km a day seemed quite a lot to Mickey when the most she had ever done was 14, she was she says, ‘very apprehensive'. Both reported their pride of having got to the finish line. Maartje, who is also making a documentary of the walk on her iPhone and iPad had extra challenges and responsibility to make sure that she could get things on film at a moment's notice. To help her, she used her bra as iPhone holder. Dedicated to the end it seems. For Mickey, there was an additional challenge when she got hit by a bolt of lightning near to Tanit's cave, cracking her ankle (Tanit is an Ibizan goddess, bestowed upon the island by early Phoenecian settlers). Despite this setback, she soldiered on, sticking to the flats and avoiding hills. Mickey's determination was such, that even when Toby, Walking Ibiza's founder and the leader of this walk asked her if she needed a lift to get to the end point, she flatly refused. Nothing could keep this woman down. She sailed on to the end, with a bit of a limp and with much pride. There had been many challenges along the way. Khosaan couldn't fit into his sleeping bag or tent on the first night – fortunately quickly resolved. John, another walker had problems with his poorly knee from the start and was unsure that he'd be able to finish, so was planning to go as far as possible and then stop. With the help of everyone in the group, he got through to the end. Another victory! Indeed, John is so pleased with his achievement that he's decided to sign up for the next walk, in Menorca. The Around the Island Adventure started life several years ago when Toby walked around the coast with just €1 in his pocket and accompanied by his dog, Cosmo. He had to rely on the charity of strangers, going to people's houses or restaurants asking for food. Today, the walk is fully supported with food and water provided as needed and much of the camping equipment transported to the next site. 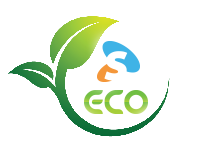 Participants need only carry around up to 5 kg with them. Simon, who provided this support found himself fielding medical supplies, fetching more drinking water or getting the odd bottle of Cava; he was even repairing kit like sleeping bags and tents. All the food was prepared daily by Toby's mum Sheila who also runs Walking Ibiza's regular Short and Sweet walks. Both Simon and Sheila had quite a full time job in making sure that everyone got what they needed and a big applause should go to both of them. 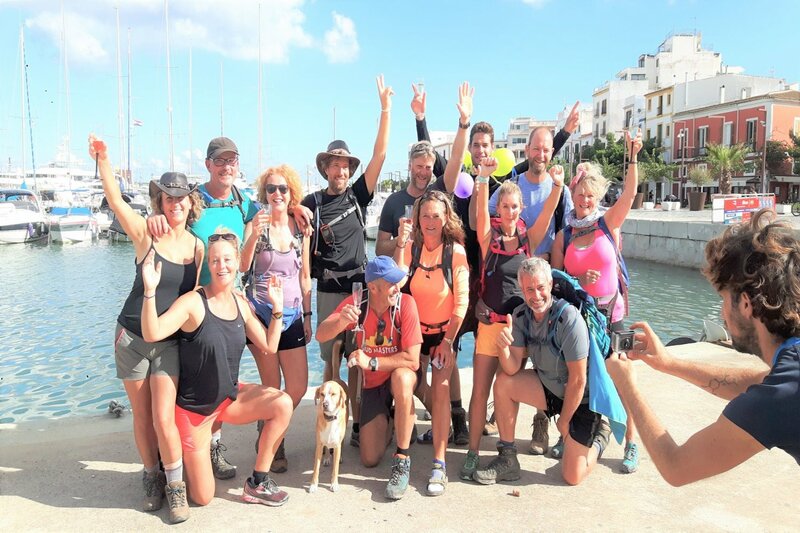 The real heroes are of course the walkers themselves who made it around Ibiza and went through many challenges, spanning not just the physical but also the emotional - it's not easy to leave your comfortable life to traverse nature this way, but all believed it was worth it. Toby is hoping that the documentary that is being made will be shown in Santa Eulalia's cinema, the town where he started life and lived by until he was 11. It would be a fitting tribute to the work he has done in opening up Ibiza's other side to the many visitors that travel here each year. If you are up to the challenge of travelling around Ibiza's coast, we are sure that Toby would love to hear from you! To check out the next Around the Island tour check this page.